In a wide range of situations, schools, banks, cash points, supermarkets, stadiums, libraries, factories, warehouses, and many more, it has become an increasing necessity to provide safety and security of some description in almost all of these environments. 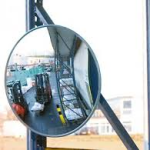 At Acorn Glass and Glazing we are able to offer volumatic surveillance/security mirrors that can assist you in providing this requirement at a low cost and with a wide range of options from which you may choose. 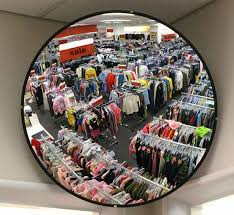 Our mirrors are lightweight, easily to install and maintain and are available in various shapes and sizes to suit your particular circumstances. They may be wall fixed, post mounted, ceiling fixed or to any other item you may require as we have brackets and fixings to suit all situations. Our technical team will be happy to assist you in deciding the size and convexity that would be most suited to your environment and the purpose for which they are intended to be used. Our mirrors are provided with an anti scratch and anti static protection and fixing kits/mounting posts can be powder coated to suit the colour scheme in which they are to be installed.